New data from mobile application tracker Flurry reveals that 20% of the companies building iPhone applications started business specifically for the iPhone platform. Flurry analyized the origins of iPhone developers. The largest amount of developers were Web companies, like Google or eBay. 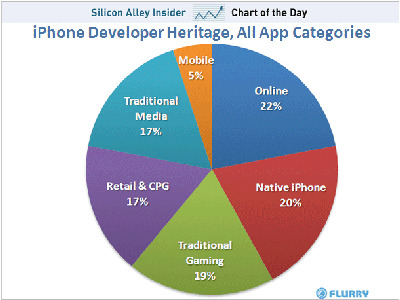 The next largest was independent developers that decided to take a chance on the App Store. Flurry says 35,000 unique companies have released applications since the launch of the App Store. 20% of that is 7,000. The App Store has produced plenty of success stories for small developers, but as the apps market grows, it could become harder for these developers. Flurry says established companies with more marketing muscle are entering the store, which could push the indy developers to the fringe. Flurry tracks 20,000 live applications on smartphones each month, and 80% of all iPhone, iPod Touch and Android devices have an app with Flurry analytics on it.